A course of real character with some astonishing carries over deep ravines and heroic approaches from hanging lies. A magnificent course with a series of stunning holes, including the all-world par-5 12th, par-3 13th and the rollercoaster that is 16. This is a really interesting course. 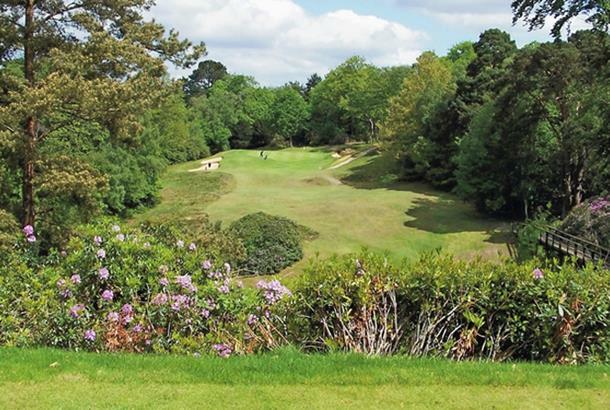 At the heart of suburban Surrey you’ll discover a gem of a course which seems to keep getting better. Immensely enjoyable if you can keep it straight, immensely frustrating if you can't! The fairways wander through mature pine and birch, which create a real feeling of intimacy. The 225-yard par-3 13th has been called the greatest one-shot hole in inland golf. The splendid Addington could easily be Sunningdale's long-lost cousin: secluded holes, picturesque surroundings and city views from its high points. It's a real treat and former members include PG Wodehouse - a foreword to one book urged correspondence to be addressed to him care of the 6th green bunker! Having been purchased in August 2006, The Addington is now a full member of the Altonwood Group. Founded in 1913, The Addington is ranked as one of the top 100 courses in Great Britain and Ireland. The course's originality is a continuing testament to the design skills of J.F. Abercromby who worked on several courses over the years with Tom Simpson and Herbert Fowler and was one of the giants of English golf course architecture. Green Fees Mon-Fri from £60; Sat-Sun £100. My favourite course and one I could play every day and not tire of. The landscape is unique, the greens fast and the welcome warm. A players course that is not for beginners or really high handicappers but so much fun for the rest of us. I might be wrong but the previous reviewer I think is confusing The Addington with Addington Court. The Addington is not part of the Crown group of courses but part of the Altonwood group. Addington Court is down the road, and actually I really like the people there - they organise a very good kids' golf camp in the holidays. Meanwhile The Addington is one of the great jewels of golf inside the M25 - an amazing track of which I am a member, so biased. So not a bad course if a little straight forward but unfortunately the one thing that lets it down (apart from the uneven tee boxes) is the fact that you book a tee time and turn up on time...and then the staff just let a load of lads turn up and go out in front of you. I'd love to say it's a one off but it's happened a few times and at other crown golf courses I've played at. Not sure why they let people do this but it is irritating and if you point it out o them you don't even get an apology. Y advice is to stay well clear of the place until they have the bottle to turn people away who have not bothered booking their time.